Eric Seaburg, PE – Project Engineer, Bolton & Menk, Inc. 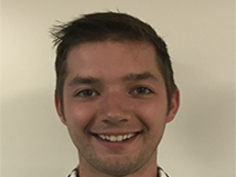 Prior to recently starting as a Project Engineer with Bolton & Menk in 2016, Eric's career started as an intern for the City of Golden Valley. After graduating from the University of Minnesota, he started full-time for the city. While at Golden Valley, Eric worked on projects ranging from street reconstructions, the multi-year reconstruction of Douglas Drive, and the city’s recent chicken study. On weekends, you’ll find Eric on a lake with a fish finder, sitting in his deer stand, or lounging around his apartment in Minneapolis. Eric has been excited to meet fellow APWA members at Chapter events, while serving as Co-chair for the 2016 PWX Futures Committee, and as a Co-chair of the Chapter’s Young Professionals Committee. If he ever started a new career he would be a: Storm Chaser. His favorite restaurant is: Chipotle. His spirit animal is a: Walleye because he loves to be in the water. One thing you may not know about Eric is: he has lost count of the over 65 first cousins he has. Thanks for sharing a little bit about yourself, Eric!